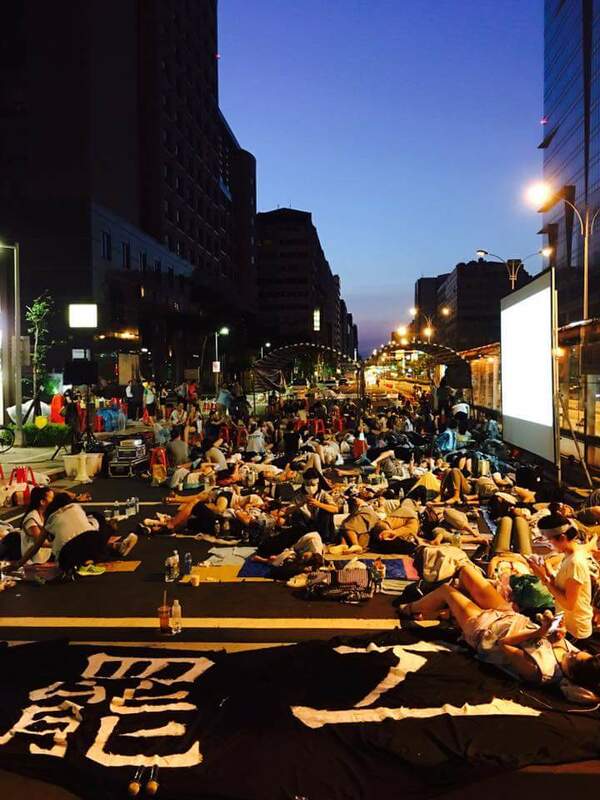 THE CHINA AIRLINES strike began dramatically last night, with an occupation of Nanjing East Road in front of the Taipei branch headquarters of China Airlines by several thousand China Airlines workers, blocking off traffic on one side of the road. 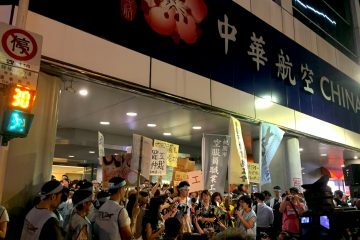 The decision to strike was announced at 6 PM on June 24th, with calls to gather at 8 PM in front of the Taipei branch headquarters of China Airlines, but it being ambiguous as to what would take place and an announcement that the strike would begin at midnight. 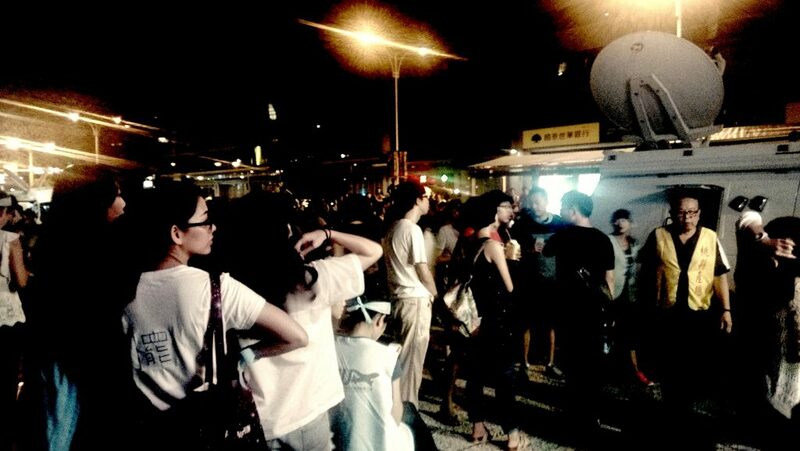 Workers on strike are from the Taoyuan Flight Attendant’s Union and are primarily airline flight attendants. Flights in Taiwan are being cancelled left and right, China Airlines being Taiwan’s largest air carrier. Most flights today from Taoyuan Airport, Taiwan’s main airport, are cancelled and flights out of Songshan Airport are suspended. Some workers have left for the night while others remain encamped on Nanjing East Road, workers planning on gathering again for further action at 7:30 AM. The original plan was to gather to move to Songshan Airport in order to illustrate to customers why they are striking, flights at Songshan not cancelled on the scale as they were at Taoyuan Airport, but what future plans end up being depending on the status of flights at both airports remain to be seen. Workers who left the occupation site left behind forms of ID, such as their Taiwan ID, mainland travel permit, or passport, in order to illustrate their commitment to their strike. It is stated that over 1,500 such documents were to be collected. 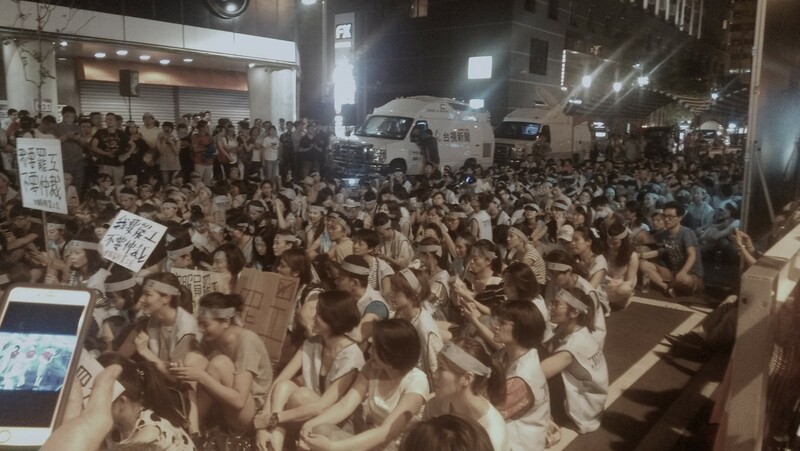 Workers that stay do so despite enduring the heat of the night, temperatures being scorching in Taipei last night with so many people gathered together in a small space. 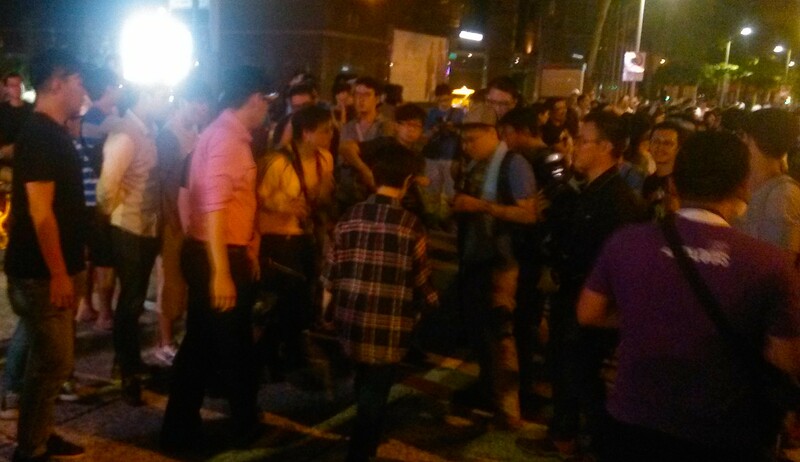 The occupation of Nanjing East Road began after an hour of speeches outside of China Airlines. 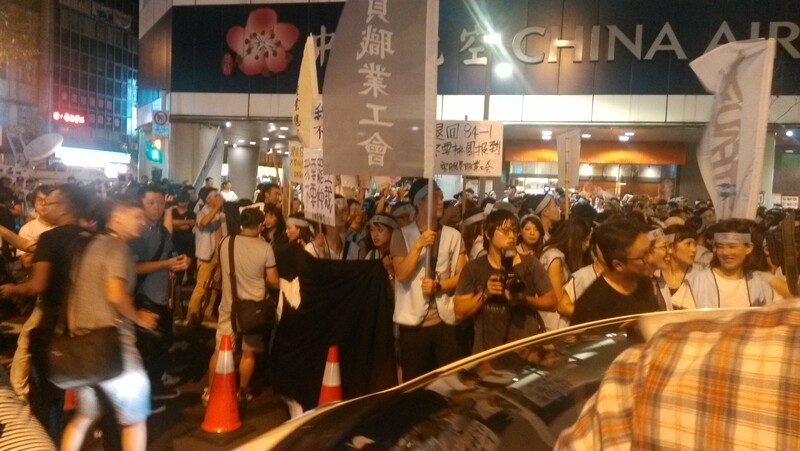 Once reaching critical mass, the demonstration began naturally spilling out onto Nanjing East Road from the sidewalk in front of China Airlines. 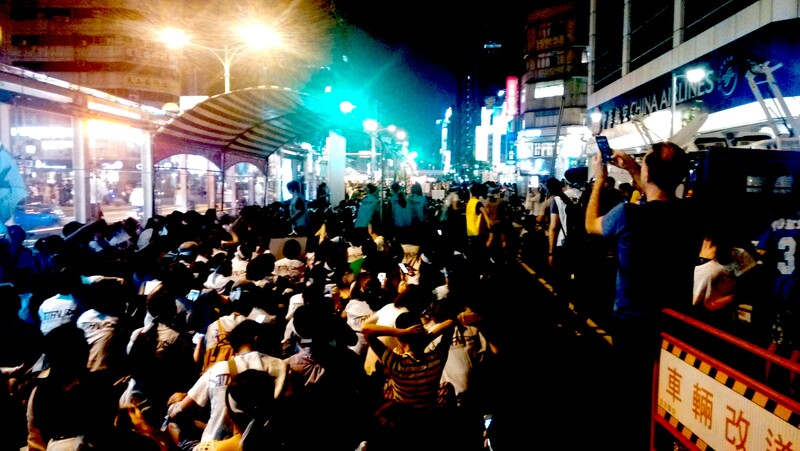 Then, with sudden call for the crowd to move out onto the street, after some attempts to push back by police, the crowd occupied one side of Nanjing East Road. After that, workers came in quickly with tents, chairs, fans, speakers, a projector screen, and even portable restrooms loaded on a truck—illustrating the clearly premeditated nature of the occupation and that workers planned to be in it for the long haul. 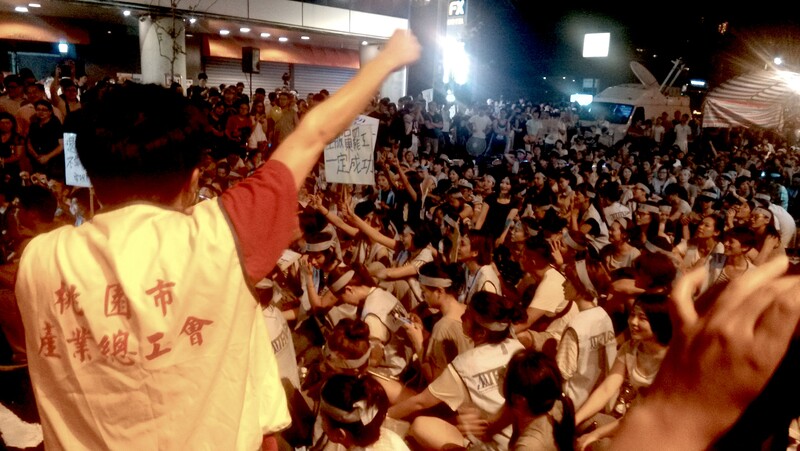 A Historic Strike: Possibly A Sign of Future Trends in Taiwanese Labor? THE STRIKE IS a historic one, as the first airline strike in Taiwanese history, and what was anticipated beforehand to be one of the largest strikes of Taiwan’s post-martial law period. 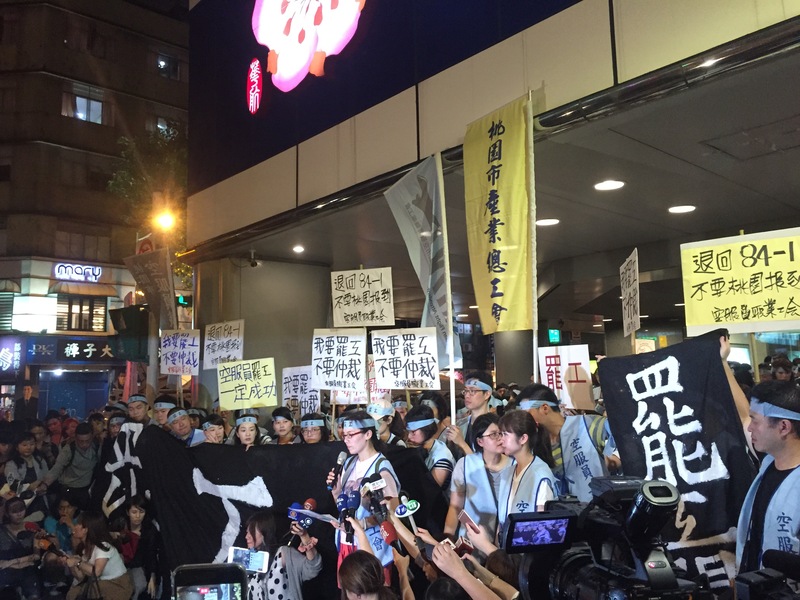 Though reported on very little in English-language media beforehand, news of the decision by Taoyuan Flight Attendant’s Union to strike was electrifying of Taiwan’s labor scene and of Taiwanese youth activism. Much of the buzz regarding the strike from activists has been because the historic nature of the strike is seen as possibly leading to future labor actions and a future wave of strikes. 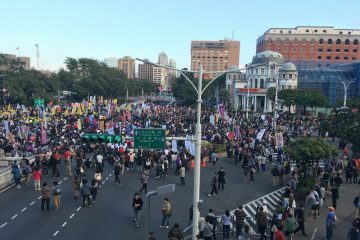 Notably, many workers on strike are quite young, indeed suggesting that youth are becoming increasingly active in organized labor in Taiwan. 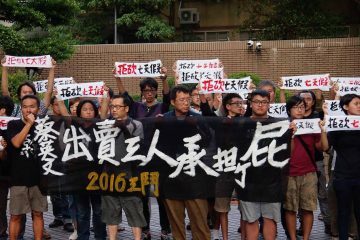 Perhaps indicative of the political views of Taiwanese young people in the present, some of the speeches on-site and a statement released shortly after the declaration that the strike was about to begin directly referred to capitalist exploitation and capitalism as the central problem facing workers. Workers also sang traditional Taiwanese labor anthem “The Laborer’s Fight Song” (勞動戰歌). At another point, after a sign expressing LGBTQ support for the strike caught the attention of the crowd, leading the MC to ask the person with the sign to come up in front of the crowd, and the crowd to chant slogans calling on Tsai Ing-Wen to take a stronger stand for LGBTQ rights—as the MC stated, this having been one of the platforms of her political campaign, but Tsai having not especially emphasized the issue once being elected. 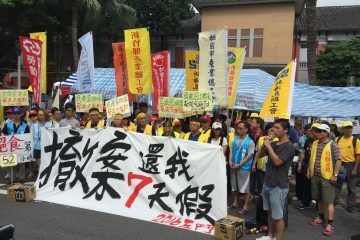 The decision to strike was made on after a fourteen day voting period, with 96% participation of the 2638 members of the Taoyuan Flight Attendant’s Union who work for China Airlines, and 99.5% of members in support of striking—well above the 70% threshold needed to legally declare a strike. The strike begins at the height of peak summer travel season, meaning that the decision strike was one that the union had to carefully consider before deciding upon the need to strike, and because there was the possibility of workers losing their jobs. During past demonstrations by airline workers in past years, workers wore masks to avoid identification for fear of losing jobs. Only after 2011, with increases in the size of unionized workers, did China Airlines workers begin to demonstrate openly. The growth of union organizing now has culminated in union capacity being large enough to sustain a strike. The present strike was preceded by a demonstration of close to 2,000 workers on May 31st, workers stating that they were hoping that management would acquiesce to their demands after a show of force, and originally not wanting to push things so far until management refused to back down. Workers cited management as having told them that they could be easily replaced and denied them their status as professionals in the past—the example being given was management stating they could go to Ximending, call out into the crowd that they were looking for flight attendants, and in that way simply replace the majority of flight attendants. 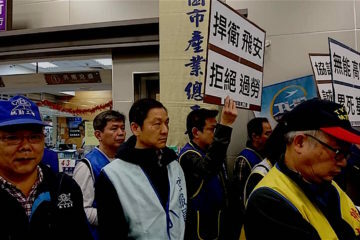 Workers have two main demands, a repeal to Article 84-1 of the Labor Standards Law, and an end to the requirement of having to report to Taoyuan Airport. As part of a waiver which workers are required to sign as part of Article 84-1 of the Labor Standards Law, according to workers, China Airlines is seeking to increase the work time of airline staff to 220 hours per month, more than the 174 hours which the act would stipulate. It is reported that China Airlines would also seek to redefine work hours for flight attendants, counting work hours as starting from 90 minutes from departure to 30 minutes after landing, a decrease from the previous policy of counting work hours from 140 minutes before departure and 60 minutes after landing. Despite the shortening of work hours in which cabin crew would be paid, the amount of work cabin crew have to perform would remain the same, however. Workers would also be signing away their rights to overtime and negotiation of work hours through the waiver. Article 84-1 of the Labor Standards Law is aimed at reducing excessive overtime. Part of the issue at hand, however, is that international airline flights can last for over eight hours. There is concern that this would lead to flight attendants working on regional flights being deprived of their rights as compared to those working on international flights, as well as loss of rest time. As such, many workers refused to sign off on the waiver. Likewise, workers were outraged by a unilateral requirement by China Airlines for workers to report to Taoyuan Airport which was instituted last month. This reduces the rest period for airline workers, seeing as Taoyuan Airport is nearly one hour from Taipei. This is seen as another cost-saving measure by China Airlines. Previously, workers were allowed to report at Songshan Airport, which is in Taipei. Workers have stressed that rest is a human right and that they are not machines to exploited endlessly for labor by China Airlines. Workers have stated that it becomes a safety concern for airline passengers if they are unable to rest. POLICE PRESENCE was minimal through the night. 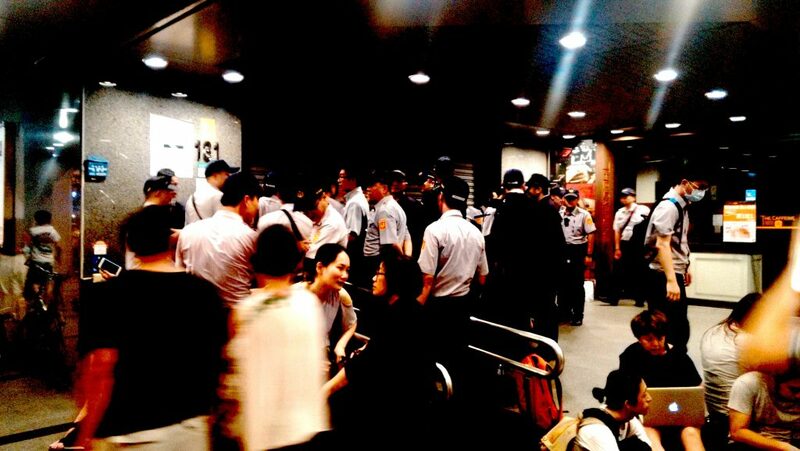 At one point, police formed a phalanx outside of the entrance to China Airlines branch headquarters before later withdrawing when it became clear workers did not plan to storm the building. Workers at several times mentioned in speeches that police do not have a labor union and that the Labor Standards Law does not legally apply to police. But Friday morning—before the beginning of the strike was announced but after the strike had been expected for some time since news of the decision to strike broke—former deputy minister of transportation Ho Nuan-hsuan appointed as chairman of China Airlines by premier Lin Chuan on Thursday. This was popularly understood in relation to the planned strike, though the Taoyuan Flight Attendant’s Union emphasized beforehand that they will still be going ahead with the strike, and that they will not accept threats from China Airlines. China Airlines, not to be confused with China’s similarly named Air China, is a former state-owned enterprise founded in 1959, dating back to the KMT party-state. Though since partially privatized, the Ministry of Transportation remains the majority shareholder. Past demonstrations have targeted both China Airlines and the Ministry of Labor and workers have stated that they see the partially state-owned nature of China Airlines as a reason for why China Airlines is able to get away with abusive labor practices—the state protects China Airlines because it is still majority owned by the state. Indeed, as tying in with demands by organized labor before and after elections that they will not be lax on a Tsai administration and call on her to defend labor rights, Tsai’s first visits to foreign diplomatic allies as president is scheduled for today—with Tsai slated to take a China Airlines flight. A flight attendant who was scheduled to work on that flight was present as one of the striking workers, though China Airlines has stated that this flight will not be affected. Workers were called on to refuse to board flights after the 12:00 AM start of the strike. After news of the strike broke, China Airlines began recalling flight attendants from other locations to Taiwan once news of the strike broke earlier tonight, some of which were not Taiwanese or based out of Taiwan. Some China Airlines attendants were stranded in immigration with attendants not allowed to leave immigration after arriving in Taiwan, because many have flights have been delayed or cancelled by the strike. 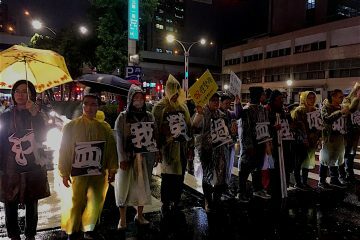 Striking workers vowed they will come to the aid of trapped workers, regardless of nationality, seeing as some of these workers are not Taiwanese—and thus, do not have benefit of membership of a union as Taiwanese airline workers. Trainee attendants were also called in to stand-by by China Airlines to make up for labor shortages despite not having finished their training. Workers on-site pointed to this as a sign of generally lax safety standards by China Airlines, as has been raised also through that workers being unable to rest means danger to flight safety. China Airlines later issued an apology to customers for cancelled flights, but did not mention striking workers in the statement. 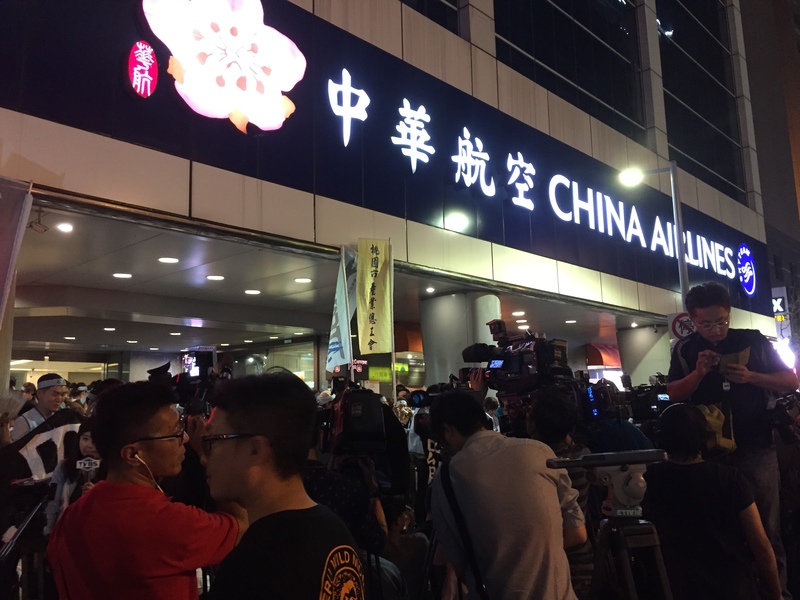 Workers suggested that China Airlines would attempt to shift blame to them, but also pointed to this as a sign that their strike was succeeding. 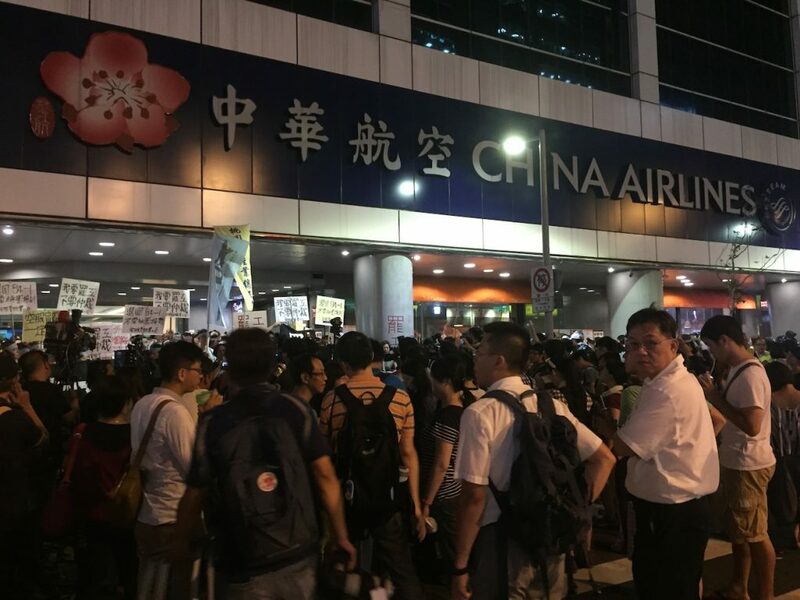 However, late in the night, one passenger whose flight was cancelled as a result of the strike arrived with a sign expressing support of workers and blaming China Airlines for the ultimate causes of his flight cancellation. Preceding the strike, the official labor union of China Airlines, the China Airlines Employees Union which member accused the strike of being provoked by “exterior forces.” China Airlines employees are mandated to be members of the China Airlines Employees Union, whereas membership of the Taoyuan Flight Attendant Union and dues payments to the Taoyuan Flight Attendant Union is voluntarily. Unsurprisingly for an official labor union part of a partially state-owned enterprise, the CAL Employees Union takes the viewpoints of management, hence the need for another labor union outside of the official one. The Taoyuan Flight Attendant’s Union has a membership of about 4,000, though most members are workers for China Airlines. As such, it also the case that the China Airlines Maintenance and Engineering Labor Union and Taoyuan Pilot’s Union are unions outside of the CAL Employees Union. The CAL Employees Union has attempted to denigrate the legitimacy of other unions outside of it as representative of employees, as a result of which the Taoyuan Flight Attendant’s Union has stressed several in the past that it is the actual representative of workers. In speeches, workers have also pointed to this as a failure of official trade unions, which are used as tools of management to prevent worker discontent from being expressed. Union representatives from other airline unions were also present to express support. The regulations against unions in Evergreen Airlines workers have been raised as well as an issue by airline union representatives from China Airlines and other airlines. THE RESOLUTION of the strike remains to be seen, with management presently taking an attitude of refusing to back down. However, the occupation and strike has seized the attention of the nation rather quickly. The airline industry being a rather central industry to Taiwan’s functioning as a nation and China Airlines being Taiwan’s largest airline, the flight cancellations caused by the strike will no doubt garner much attention—in particular because it is currently peak travel season. But workers have emphasized that they are ready and prepared for a long struggle. We will see as to the China Airlines struggle as well as what precedent this sets for future Taiwanese labor organizing overall.